We have a gun problem in America. The problem is, we really, really like them. Everyone has guns in rural Oregon, where I grew up. But somewhere between there and here and then and now, my feelings on the subject have grown complicated. 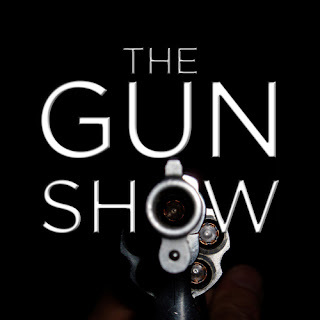 This is a show about guns and gun control -- Dirty Harry, Trayvon Martin, the NRA, Columbine, Tarentino, Sandy Hook. This is a show about my own experiences with guns. Can we let go of our firearms? Do we want to? and a short conversation with the writers, directors and performers. 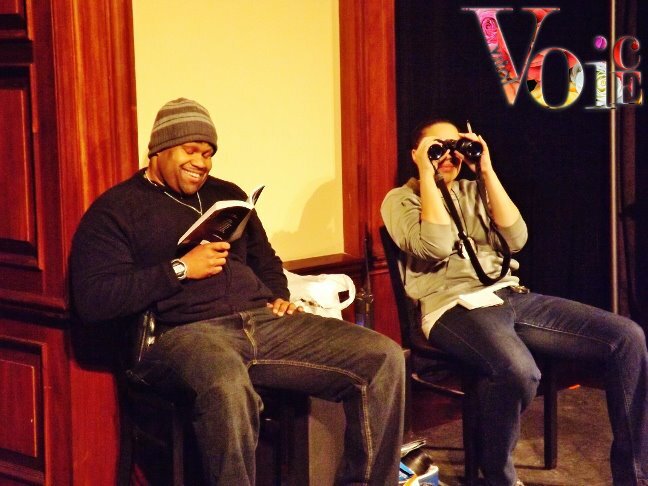 Emerging Artists Theatre (EAT) New Work Series is a three-week developmental festival that provides artists of different disciplines the opportunity to present one night of a “work in progress” with audience feedback. Successful Fringe, NYMF, and Off-Broadway shows have been born out of this festival, and Emerging Artists is excited to present a new round of opportunity to local artists for the 9th year in a row. I had an unexpected adventure at the end of February. I received an inquiry from a colleague, asking if I might be interested in responding to student work at the Region 6 finals of the Kennedy Center American College Theater Festival in Shreveport, Louisiana. I said heck, yeah! And off I went to see plays, analyze plays, talk about plays, teach a workshop about writing plays, and eat a heck of a lot of gumbo. It was fabulous! I'd heard of KCACTF. It's a nationwide competition that honors college theater student's work in all categories, from acting to directing, writing, and design. Several of my friends who teach bring students to the competitions regularly. I was honored to be a respondent for the playwriting students. There was so much smart, funny, fabulous writing! And I love having the chance to support young playwrights in their journey. People have been so kind to me along the way. When I arrived in Shreveport, I went to work almost immediately, shaking hands with the head of the playwriting group, David Blakely, and his second in command, Jim Tyler Anderson, and with my fellow respondents, Guillermo (Billy) de Leon and David Moberg, and then walking straight into the room to listen to the first one-act play we would be critiquing. Luckily, our little team worked very well together, and I think we gave the student playwrights in all categories -- ten minute plays, one acts, and full-lengths -- good feedback throughout the week. 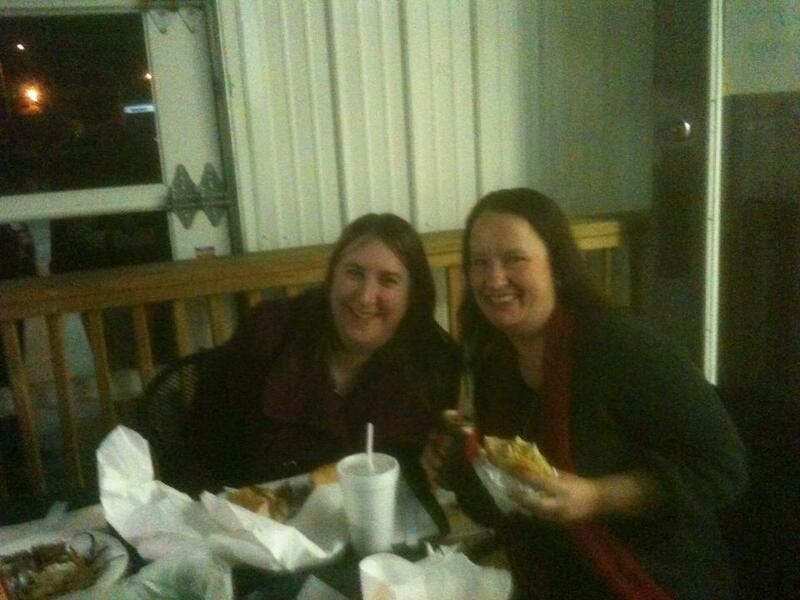 Sharing food and stories with Heather Helinski, who was running the dramaturgy unit at KCACTF Region 6. The week was chock full of work and fun, as we responded to plays, watched the mainstage shows (two per day), taught workshops, and talked shop. Region 6 is comprised of six of the southern central states, but there were theater professors and professionals from all over the country participating. The food was fantastic. I'd never been to Louisiana before, and found the gumbo to be exquisite. I was also able to see Harold Hynick, from Missouri Valley College, and some of his student actors and designers who had worked on the production of "Heads" in the fall, which was lovely. The actors presented a scene from the play in front of the entire festival, and the designer won an award for her work! 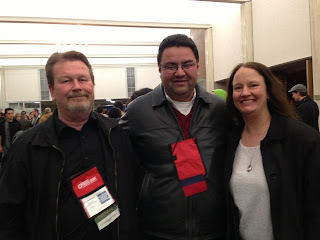 I saw Mark Charney there, who I'd met at the Great Plains Theater Conference. And I made some new friends -- including dramaturg Heather Helinski. I hope that I'll be able to be a respondent again next year! 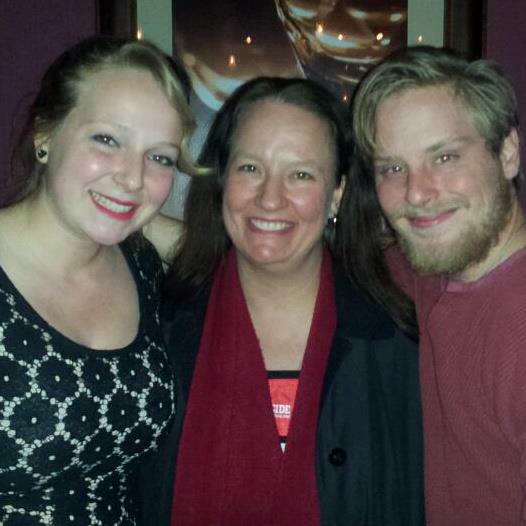 With Sam and Tommy, who played Caroline and Harold in the Missouri Valley College production of "Heads." We had a lovely talk about the play, and their plans for after school. 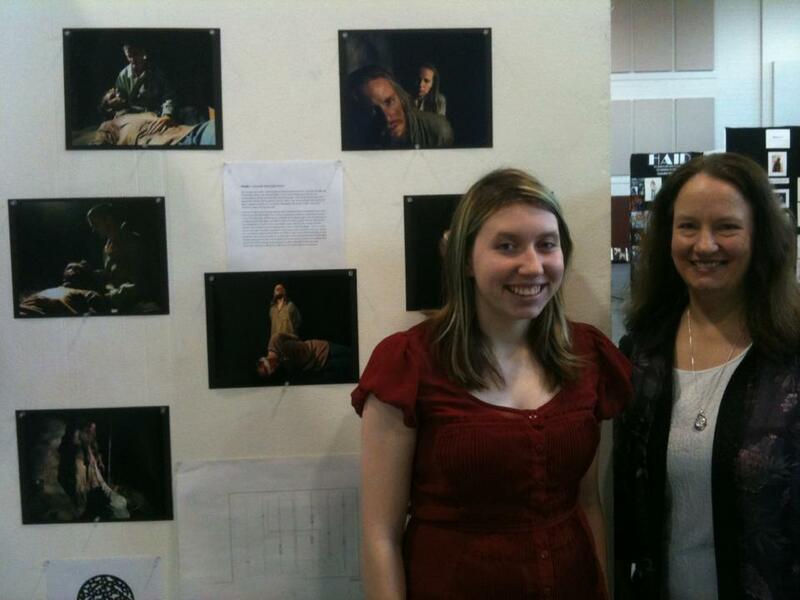 Me and designer Katie Combs, who won an award for her work on my play "Heads" in the Missouri Valley College theater production in fall of 2012, at KCACTF Region 6. Have you ever had characters who wouldn't stop talking to you? Terry and Pete are like that. They crack me up. "Waiting for the Skell" by EM Lewis, directed by Bonnie Taylor for the 2013 Briefs Festival in St. Louis. I created Terry and Pete a few years ago for a comic ten-minute play called "Partners," about a lesbian cop who was bringing her work partner -- a gruff, funny, un-PC guy -- home to meet her life partner -- a smart, sassy, strong-minded woman who was none too happy to have to share. 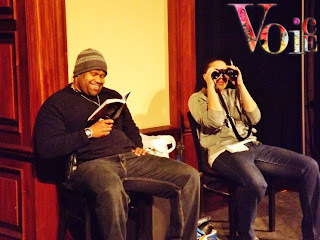 It's become one of my most frequently produced ten minute plays, and was done as part of the Briefs Festival in St. Louis last year -- a festival of short plays on LGBT themes, produced by That Uppity Theater Company, in association with Vital Voice Media. 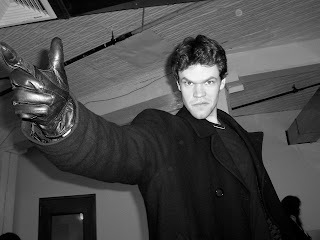 Well, when the fabulous Joan Lipkin, who runs TUTC, called and asked if I had any short plays to submit this year, it spurred me to polish up the next installment in Terry and Pete's partnership -- a stake-out story, called "Waiting for the Skell." In a move that absolutely delighted me, Joan brought back our director (Bonnie Taylor) and cast (Robert Lee David and Wendy Renee Greenwood) from last year. I so wish I could have been there to see it! KDHX: "In “Waiting for the Skell,” two police officers, one gay, one straight, share an easy companionship and comfortable openness with each other that brought tears to my eyes during the final moments. 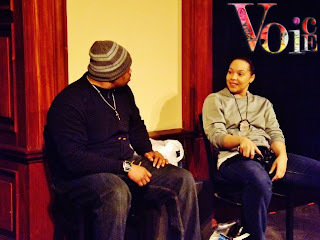 The bond these actors created in this short play was convincing and effective." For more information on the Briefs Festival, click here!